In an effort to help you and/or your ensembles, we wanted to share this valuable information regarding an upcoming educational clinic on November 13 at the Santa Clara Vanguard Corps Hall. Please see below for details. 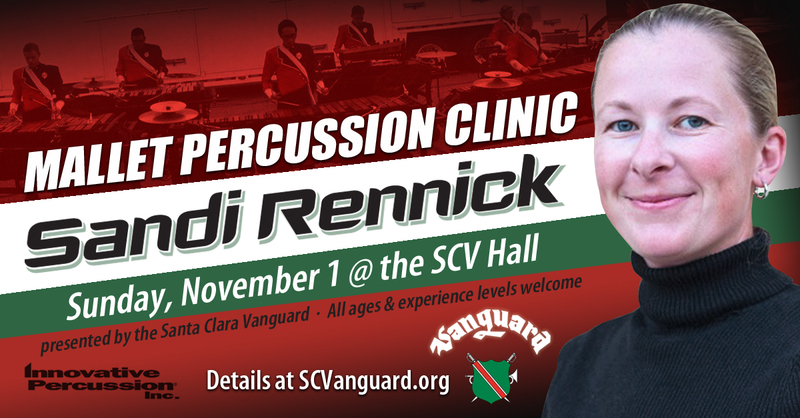 Sandi Rennick, Santa Clara Vanguard (SCV) Percussion Arranger/Composer and a leading voice in the marching percussion community, gives an educational mallet percussion clinic on Sunday, November 1 from 12-4PM at the SCV Corps Hall. The clinic will include instruction, insights, and demonstrations of 2 and 4-mallet percussion techniques. Presented by the Santa Clara Vanguard and Vanguard Winter Percussion (VWP) in partnership with Innovative Percussion, the clinic is open to ALL AGES. Beginning to advanced-level students, band directors, percussion instructors, and even rudimental percussionists looking to expand their mallet percussion knowledge are all encouraged to attend. Registration/Check-In will begin 1 hour prior to the event. The registration fee online is $40 per person ($50 in-person day of event), and includes refreshments. Payments can be made via MySCV or in person with cash, check, Visa, or MasterCard.